You can follow Charles Robinson on Twitter at @YahooSportsNFL. There are no hidden cameras to be seized, no long-established feelings of hatred. The key figures involved have yet to carve out rock-star status in the NFL, and unless something unexpected comes to light, the NFL won't be destroying any evidence. So, no, this isn't Spygate. However, it might actually be worse. Crabtree was the second receiver taken in April's draft. That's what some league executives and at least one owner had to say this week, after the San Francisco 49ers, frustrated at their lack of progress in signing No. 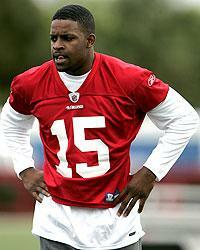 10 NFL draft pick Michael Crabtree(notes), filed a tampering charge against the New York Jets. In what executives are viewing as an extremely serious allegation, the 49ers are alleging, either tacitly or directly, the Jets have played a role in undercutting San Francisco's ability to sign its first-round pick. And while the charge doesn't have the sparks and scandal of Spygate, in which the New England Patriots were disciplined for illegally videotaping Jets' defensive signals in 2007, it's being viewed as no less serious in some NFL corners. "[Spygate] was limited," said a high-ranking NFC executive. "That's something where – that information or competitive edge or whatever you want to call it, was limited to one team gaining an advantage over another team. But that's just two teams. … We all have first-round picks – 32 teams have first-round picks. "It's hard to prove if it did happen. But if it did, it's cheating the whole draft. You shouldn't even be thinking about someone else's pick. When the draft is over, that's their deal and you have your own [selections] to worry about. It's none of your business what is happening in someone else's [negotiations]. If that [tampering with draft picks] flies, we might as well just make all the college players free agents." The crux of the 49ers' tampering charge still hasn't been fleshed out publicly. But NFL security officials have already been tasked with the investigation, and three league sources told Yahoo! Sports the 49ers believe the Jets were in contact with Crabtree's agent, Eugene Parker, to talk about the former Texas Tech wideout after he had already been selected in the draft. It's certainly not the first time these two teams have been entangled in a league investigation. The 49ers are the last team to have a draft choice stripped, a fifth-rounder in the 2008 draft, for tampering with Chicago Bears linebacker Lance Briggs(notes). The Jets were accused of tampering with Patriots receiver Deion Branch(notes) in 2006, and also were fined $125,000 earlier this month for manipulating their injury reports last season. ESPN also reported late last month that the Denver Broncos were considering filing tampering charges against the Jets in relation to wideout Brandon Marshall(notes). No charge was ever filed in that case. While it's not known if San Francisco is alleging negotiations took place between Parker and the Jets, it's worth noting that Deion Sanders, a former Parker client and self-described occasional "counselor" to Crabtree, insinuated in an interview with the NFL Network that Crabtree believes he can get "$40 million" from an NFL team. Said Sanders in that interview, "Why would you settle for $20 million [from San Francisco] when you feel like you can get $40 million? That's the problem." Sanders also reiterated that Crabtree would be willing to re-enter the 2010 draft, further fueling speculation the rookie has some kind of salary guarantee from another team. Theoretically, Crabtree could secure the contract he desires from another NFL team and then hold out the entire season, forcing the 49ers to eventually trade his rights – ideally to the team which has already hammered out the contract he desires. Per league rules, San Francisco cannot trade Crabtree's draft rights until March – something the team would likely do if it appears Crabtree was certain to re-enter the draft. Parker, who could be disciplined by the NFL Players Association if the charges are found to be true, didn't return a phone call seeking comment on the tampering charges. Both 49ers general manager Scot McCloughan and team president Jed York refused Yahoo! Sports' interview requests through a spokesman last week. However, the Jets vehemently denied tampering with Crabtree this week. "It's not accurate," Jets coach Rex Ryan said of the charge. "It's not true. But we'll let the league figure this out. I've said all I'm going to say about it. It's not true." Barring the discovery of some significant evidence, the tampering charge will be difficult to prove. Many NFL front-office executives consider tampering to be a consistent league problem, whether it's occurring with potential free agents or disgruntled stars looking for an exit strategy from a franchise. And it's not uncommon for executives who have been long removed from the NFL to admit to some form of tampering (though they typically don't name specific incidents). Interestingly, former NFL executive Michael Lombardi told Showtime's "Inside the NFL" this week that he took part in tampering during the course of his NFL career, which included stints in the front offices of the Cleveland Browns and Oakland Raiders. "It's very difficult to prove," Lombardi said. "Trust me, I've been a tamperer. I've been in the NFL for over 20 years, so I have tampered my fair share of times." But rarely does a charge involve one team accusing another of undermining its negotiations with a draft pick. And that's what makes the latest charge a hot-button issue in other league corners. As one owner told Yahoo! Sports, "Can you imagine what this does to the league if you start interfering with draft picks and the ability to sign them? If [Parker] gets this kid some deal next year [from another team] that doesn't make sense, I'm sure that the other owners are going to have a fit. … It's ridiculous. You're talking about a player who probably could help [the 49ers] win some games and that's been toyed with. If I was [Jed York], I'd be furious."